As HCI becomes less of a hardware play, some vendors lose and others win dominant positions on the latest Magic Quadrant. Blog: Can Your Database Keep Up? 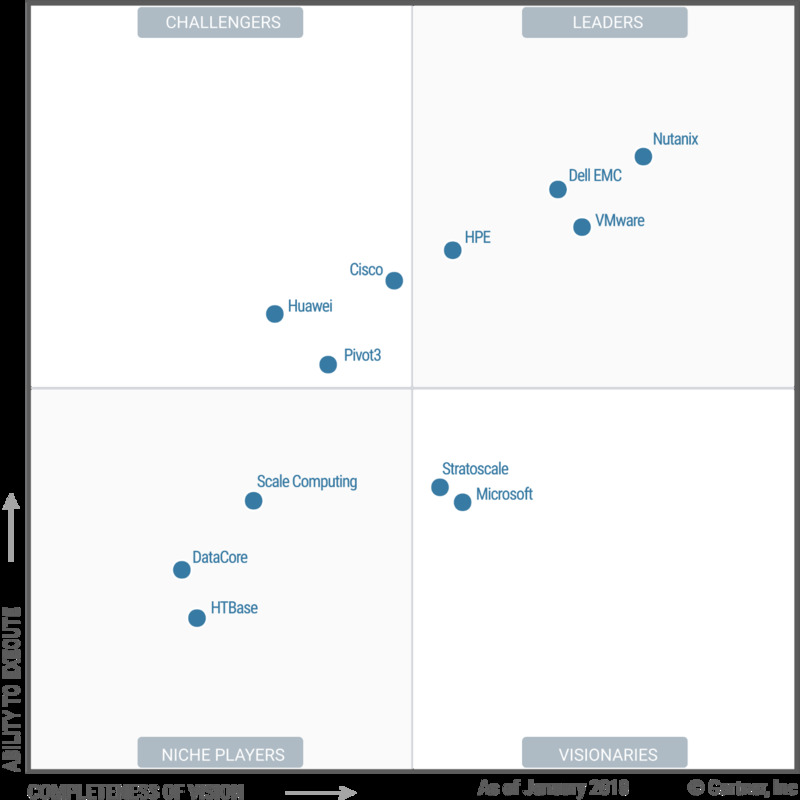 At first glance, the new Gartner Magic Quadrant for hyper-converged infrastructure seems to show bad news for some of the featured vendors. But, as Gartner research director Jon MacArthur explained to Data Center Knowledge, this report uses such a different definition of “hyper-converged” and has so much narrower a focus, that you can’t compare vendor positions to previous years. In particular, software-only, “bring-your-own-hardware” hyper-converged systems have become significant enough to earn a place in the report, because they’re increasingly competing with hyper-converged hardware appliances. “Most of the core technology is starting to shift to software. If you buy a vSAN ReadyNode from Lenovo or Cisco, or HPE, or your pick of server platform, they're all pretty much the same,” MacArthur said. “Customers are evaluating vSAN and ReadyNode, not so much the hardware. Dell EMC VxRAIL is a popular deployment model for vSAN, but so is putting VMware on your own choice of hyper-converged hardware. Whether a buyer goes an appliance or does the integration work on their own depends on their level of sophistication, he explained. Also, special needs like rugged hardware, for example, can lead retail or military clients to do hardware assembly on their own, putting the computing equipment in purpose-built boxes. That gets more attractive with improved data deduplication and mirror-accelerated parity volumes in Windows Server 2018, alongside Linux container support. If Microsoft can convert even a small portion of the Windows Server installed base to hyper-converged, those clients would represent a large portion of the hyper-converged market. A significant part of the appeal is the ability to manage that hyper-converged infrastructure with the familiar System Center. Being able to rely on existing skills offers the benefits of going hyper-converged without as much disruption and retraining, which is especially valuable, because hyper-converged infrastructure is often introduced as part of a stratification of the data center. Increasingly, enterprises are starting to create three pools of capabilities in their data centers. “One is integrated systems or older-school three-tier architecture for their absolute mission critical ‘can't go down’ applications,” MacArthur said. He emphasized that hyper-converged infrastructure isn’t displacing these systems but sitting alongside them. Gartner predicts that only 20 percent of business-critical applications currently deployed on three-tier IT infrastructure will have moved onto hyper-converged infrastructure by 2020. In some cases, enterprises see hyper-converged infrastructure as part of their journey to cloud, making dedicated hardware appliances less attractive. This is especially true for those using Microsoft Azure and Azure Stack. They go with a full-stack Microsoft offering, thinking two or three years later they can run on hybrid cloud or fully in the cloud. “Then you’ve got SimpliVity with their hardware acceleration, which provides tremendous value for the environment they’re going into,” MacArthur added. “Their dedupe compression card delivers a service level to a lot of companies to start to replace backup solutions with native deploys of SimpliVity.” Since early last year, SimpliVity has been part of HPE. Pivot3 has a relatively small number of customers, but he called out both their reputation for customer support and the new Acuity platform that moves beyond its previous video surveillance and VDI focus. “You can begin to think about Pivot3 more for enterprise workloads,” he noted.